Learn the Benefits of Volunteering and How to Get Involved! As you may have noticed from your time here, The Other Side is powered by members of the recovery community just like you. The very same people who come here for support are the ones who volunteer to support us. So, have you considered volunteering? 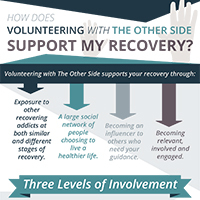 When you volunteer with The Other Side, you don’t just help us—you also support your own recovery. Let’s take a closer look at the benefits of volunteering with us, as well as the three levels of involvement available. You can probably already imagine how volunteering has a positive effect on you and your recovery. The feelings of purpose, responsibility, and fulfillment go a long way. However, on top of that, volunteering with The Other Side provides its own additional set of benefits. For one thing, volunteering with The Other Side exposes you to people both further than you and not as far in their recoveries. 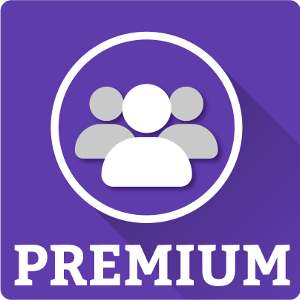 This introduces you to a whole social network of people with similar experiences. That helps you contextualize your own progress and establish a stronger support system. On the one hand, meeting people who are further along in their recovery gives you an opportunity to see that others have made it through situations as bad as yours, and worse. That can provide some much-needed perspective and encouragement. On the other hand, meeting people who aren’t as far along as you lets you serve that same role for them. You’ll demonstrate to yourself that you have something of value to offer others. Additionally, because The Other Side is so close and tight-knit, you’re not just plugged into a system. You immediately become an influencer and have your views and suggestions taken seriously. You’re given the opportunity to be relevant, involved, and engaged. 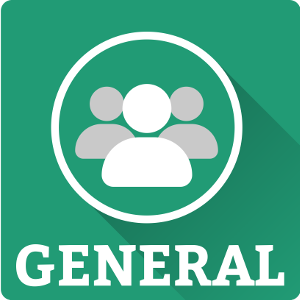 At The Other Side, there are three tiers of volunteer work available to you: General Volunteer, Associate Board Member, and Board member. Each has different requirements and responsibilities. They include anyone who requests to be on the volunteer roster. They sign up for individual events (comedy and music shows, seminars, etc) and/or join committees (finance, fundraising, volunteer management, events, etc). They are voted onto the Associate Board by the Board. Associate board members are expected to be a part of the organization and answer the call to action. There’s no concrete attendance expectation yet. They act as supervisors and leaders of tasks carried out by general volunteers. An Associate Board Member serves as the President, Chair, or sometimes peer leader of a committee. This is a position of influence, where you’re not just carrying out tasks. This individual was an Associate Board Member who fulfilled the attendance requirement, i.e. 6 months of showing up to all board meetings. Here there’s a total expectation of leadership. A Board Member doesn’t just fulfill tasks but stands up for and speaks for the organization. The Board Member makes sure all volunteers within their circle of influence are moving forward with the organization’s purpose and values as the guiding force. They also get to vote on decisions as a member of the board, on things like spending, staffing, and procedural changes. Other members still get to attend and express opinions at Board meetings, though. As stated above, you’re immediately taken seriously and listened to. This is why The Other Side is so successful at forming a supportive community: we listen, and we see your value and potential. We’d love to see you in action and watch you become a leader in our community—give us a call at (779) 220-0336 and ask about our volunteer roster!